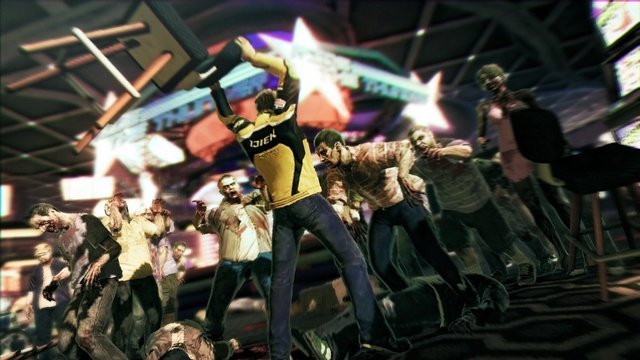 A little over four years ago, Dead Rising was one of the better reasons to own an Xbox 360. Taking the free-roaming sandbox style gameplay elements that Grand Theft Auto had made rather popular and combining them with zombies seemed like a no-brainer, and the result was a game that, simply speaking, was a lot of fun. Granted, the game was a bit mechanically frustrating in many respects, but the idea of running around in stupid outfits ruining zombies with ridiculously impractical weaponry was an appealing one, and with the basic groundwork laid, a sequel that really refined the gameplay seemed like a sure winner. Capcom’s announcement that they would, in fact, be releasing a sequel to the game was undermined somewhat, however, by the announcement that they would not, in fact, be DEVELOPING it, instead choosing to hand off the development duties to Blue Castle Games. Aside from the fact that Blue Castle’s only real projects prior to this have been baseball games, as Bionic Commando showed, Capcom does not, one would note, have the best taste in third party development houses, making it somewhat hard to be optimistic about the announcement. But then the details started coming in. Combinable weapons? Setting the game in Las Vegas? Online multiplayer? It was hard not to be a little enthusiastic, especially after Dead Rising: Case Zero showed that the game, or at least that expanded demo of it, was coming along nicely. So, this, then, is the concern: does Dead Rising 2 improve on the issues of the first game while retaining the elements that made the experience fun in the first place, or does it amount to a bunch of fluffy add-ons on a game that’s still fundamentally broken? 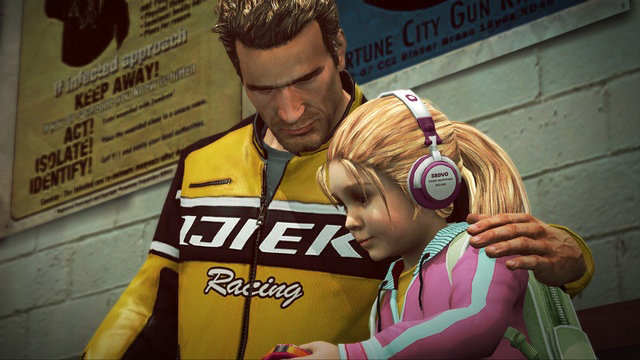 Dead Rising 2 places you in the shoes of Chuck Greene, former motocross star and devoted father who is attempting to earn enough money to ensure that his daughter, Katie, can continue to receive her daily doses of Zombrex, a zombification inhibitor invented in the wake of the events of Dead Rising. After competing in the reality TV show “Terror Is Reality”Â for money to buy the drug, Chuck’s world turns upside down as a zombie outbreak occurs on the premises, turning the surrounding area into a massive zombie infestation zone in the process. Chuck not only has to survive for the three days required until the military arrives to save everyone, but must also ensure that he has enough Zombrex to keep his daughter alive while attempting to find out the truth of the sudden conspiracy he finds himself involved in when he is accused of starting the outbreak in the first place. So, no pressure or anything. On one hand, the writing is fairly solid, and the various characters are fleshed out well enough to be interesting and keep the story moving. The story seems to have a bit more of a handle on its B-movie quality as well, as the dialogue tends to feature plenty of obvious and groan-inducing puns and inside jokes in-between the serious moments, and the wonky pseudo-science is kept to a minimum, leaving it to the user to fill in the blanks. The game is also full of colorful personalities, between the over-the-top psychos you’ll face and the ridiculous survivors you’ll have to assist, which also adds to the game’s charm. The story still isn’t good in the strictest sense, as there are still some plot holes and ridiculous elements throughout the game, but the plot works and it’s engaging and fun enough that the issues really don’t matter all that much. 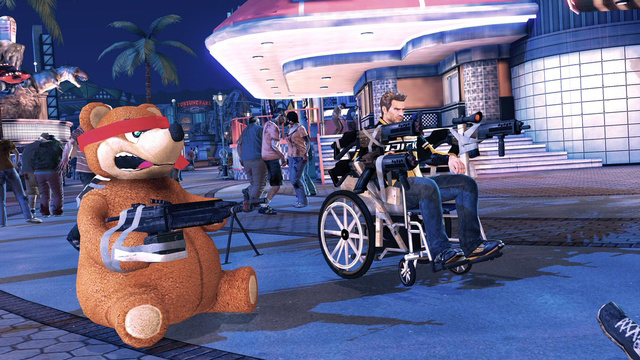 Dead Rising 2 looks a good bit better than its predecessor, both on an artistic and a technical level. The gaudy backdrop of the Las Vegas inspired strip is impressive and serves as a nice contrast to the generally everyday look of the Willamette Mall from the previous game, and the amount of zombies on screen and draw distance are noticeably improved from the original. The character models are animated well all around and look good in motion, and the zombies feature more variety in design than their predecessors. There are some odd graphical issues, both stylistic (zombies can be dismembered, people cannot) and technical (clipping pops up here and there), but for the most part the game looks good and maintains a solid framerate throughout the experience. Aurally, the game is just as good as its predecessor, all in all. The voice acting is very strong throughout the game, featuring some solid performances from the main characters all around, and the various random voices that are used for survivors are good as well, though they do repeat here and there. The in-game music is fitting to the experience, between the goofy jingles that play as you run around the different environments to the scores that pop up at dramatic moments, and the developers actually got some acceptable hard rock music for the psychopath battles this time around, courtesy of the musical act Celldweller, which work well enough. The sound effects are also great all around, between the various weapon effects, ambient noises from zombies, toys, slot machines and other things, and of course, the sounds of zombies being rent asunder by whatever means are at your disposal. Dead Rising 2 more or less plays like its predecessor at first glance, though there are some noticeable and welcome tweaks made here and there. The left stick controls Chuck while the right stick looks around, and the face buttons allow Chuck to jump, attack, call out to survivors and interact with objects and environmental devices as needed. The bumpers cycle through your inventory, the left trigger allows you to aim from an over the shoulder perspective, and the right trigger throws or shoots while using the left trigger to aim. You can also use the D-pad for various things, with the left direction bringing up your watch for time monitoring and mission selection, the right direction answering urgent messages when they come in, the down direction dropping your presently equipped weapon, and the up direction putting your weapon away if you have a free space or dropping it if you don’t. The back button brings up the map, while the start button pauses the game, allowing you to review your combination cards, stats, and other such elements. The driving controls, when they come up, aren’t bad either, as the left trigger reverses, the right trigger accelerates, and the left stick turns the car/motorcycle/wheelchair/wheelchair/whatever. Some combat techniques will require you to use multiple buttons at one time, but for the most part, the game is very simple to pick up and play, and most should have no problem learning the basics. 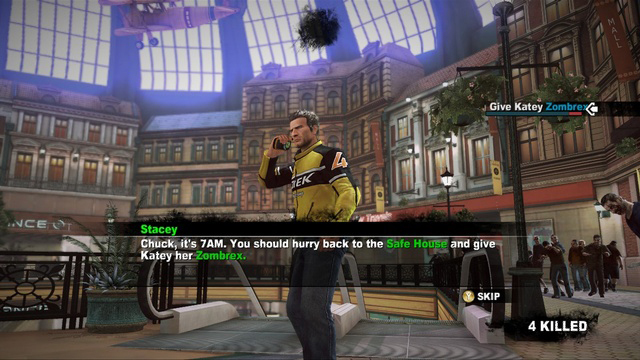 The main objective of Dead Rising 2 isn’t specifically to slay zombies, though you can be forgiven for thinking as such. Rather, you’re given three major goals throughout the course of the game: follow the plot specific missions to uncover the truth, save survivors, and kill psychopaths that get in your way as needed. The game operates on its own internal seventy two hour clock that ticks down as you play, and at the end of that time, the military will show up to save the day, in theory. During this seventy two hour period, various objectives pop up in one of those three categories that you can choose to pursue or ignore. Story based missions follow the plot of the game, and progress said plot along to its conclusion, and while you aren’t obligated to complete them, doing so resolves the plot of the game, which is pretty much the whole point of the endeavor. Saving survivors is exactly what it sounds like: various people have managed to survive the zombie onslaught and are out in the strip, somewhere, trying to survive in some form or fashion, and Chuck can assist them and bring them back to the safe house for extraction when the military arrives. Most survivors are capable of following along with Chuck on their own, but some will require a shoulder to lean on or to be carried from place to place, and you can arm the mobile survivors with various weapons should you choose to do so. You can have multiple survivors following Chuck at any one time, so you can actually get together decent sized groups of people, arm them up, and parade them around the strip, letting them wantonly waste anything that gets in their path for laughs if you wish, which is amusing if nothing else. Finally, various people around the strip have, for whatever reason, completely lost their minds, and as such behave in an openly antagonistic fashion towards Chuck for one reason or another. 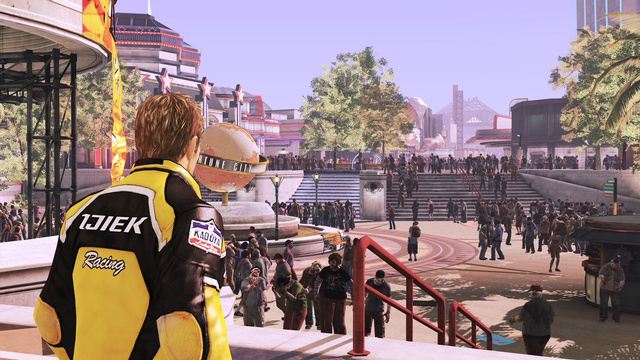 These people, dubbed psychopaths, are the “boss battles”Â of Dead Rising 2, as these people are hardier than your typical zombies and are often armed fairly well, meaning that you’ll have to be prepared to take them on and the battles will be more involved than just you hacking into them and hoping for the best… well, usually, anyway. Now, you don’t HAVE to do any of the above if you don’t want to, and if you just want to run around smearing zombies and trying on outfits, hey, go nuts, but the above missions are basically what you’ll have to do in order to complete the game, so sooner or later you’ll end up doing something with them. Every mission has a time limit, however, so if you don’t get to a mission in time, it expires. This doesn’t mean much with psychopaths and survivors; they simply die, presumably, and you go on without having dealt with them. With story missions, however, if one expires, all of the follow-up missions are lost to you, so if you ARE trying to follow the plotline, you’ll want to pay attention to the timers for those missions and complete them as needed. You have full access to a map to show you where you need to go next, and the game will helpfully pop up an arrow to indicate where your next objective is if you’re looking to get somewhere, though completionists will note that not all of the missions available will be advertised to you, meaning that you’ll want to pay attention as you’re running around to see if there are any random psychos or survivors you can pick up. To help you along in your missions, Chuck can pretty much pick up and use anything in the game environment as a weapon or tool to help him out. Drinks and food of various sorts litter the game world, which Chuck can use to keep his health up, and mixing up drinks at local blenders allows for even more powerful concoctions that can heal more life or impart additional effects, though too much booze can make Chuck barf his lungs out. Smaller weapons, like bats, golf clubs, axes and so on can be carried with Chuck in his inventory, meaning that Chuck can have multiple tools for the task at hand, since weapons do break eventually, though larger implements, like boat oars, cash registers, and so on cannot be stored and will have to be carried or dropped, though most of those aren’t really practical weapons anyway. As you save survivors, kill psychos, complete missions and do other things, Chuck will earn PP, which allows him to level up when enough is earned. Level ups can give Chuck more health, inventory space, speed and attack damage, and can also learn Chuck new moves, among other things. Chuck’s level carries over from one session to the next, so even if you fail at the missions and want to restart you’ll want to save the game and start over if you can, if only because going into the game with a few more levels makes the experience a good bit easier, especially once you learn how to dodge. The same is true of beating the game, so if you go through one session aiming to complete the storyline, you can save and start over with your levels intact if you want to save all of the survivors, for instance, so you don’t have to completely start over every time you play. All of the above will be old hat to fans of the original game, but Dead Rising 2 does a lot of new stuff to really make it feel like a sequel instead of just a glorified expansion pack. The first major addition is the ability to make combination weapons. 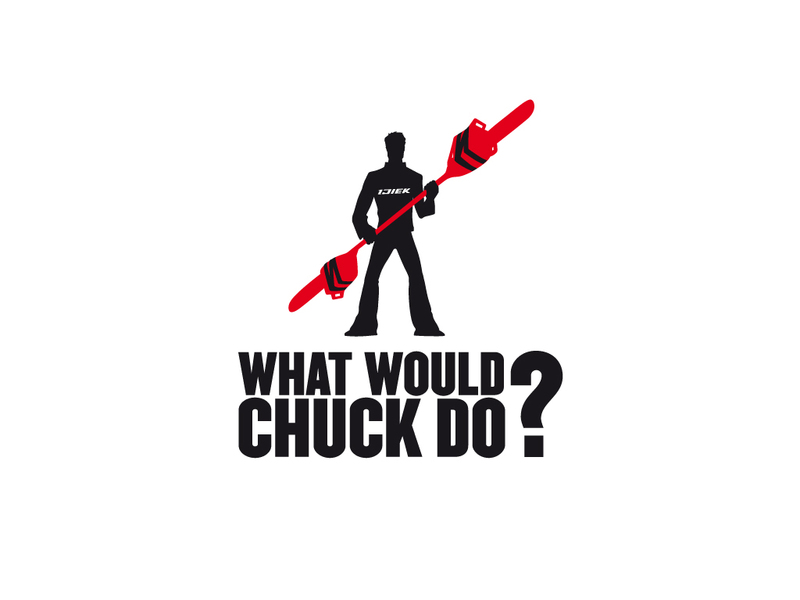 By combining two items (nails and a bat, boat oar and chainsaw, gems and flashlight) Chuck can make a powerful new tool to use (Nail Bat, Paddlesaw, Laser Sword) in his fight against the dead. Each of these various tools imparts various benefits that makes them worth making, and with the weapons, using them in battle earns Chuck additional PP for successful kills. Chuck can either perform light attacks with a simple press of the attack button or heavy attacks by holding the button, and with combination weapons, this often means that Chuck performs a completely different, massively damaging, high PP earning attack by holding that button. For instance, Chuck might simply swing his Nail Bat around by pressing the button, which earns minimal PP but takes out groups… but by holding the button down, Chuck will take a hard swing into a zombie’s head, sticking the nails in, then rip the bat out for major damage and bonus PP earnings. Aside from earning major bonus PP that helps Chuck level up faster, these attacks are generally impressive, and can be quite useful in different situations, so experimentation is always a good idea. As Chuck levels up, studies posters and such, and talks to survivors, he’ll earn new combo cards, which unlock new recipes for mass destruction. You can make a tool without having a card, which earns you a scratch card, indicating that you know HOW to make it, but don’t get the full benefit that having a combo card would impart. This generally means that you can’t use its most powerful attacks, depending on the item in question, so it’s worth it to get the combo card as soon as you can in some cases. Aside from that, Chuck can also earn money by doing various things, including breaking slot machines and ATM’s, saving survivors, gambling, and just plain picking it up off the ground. Money does not, by itself, do much, but you can use said money for a number of purposes. Some survivors won’t go with Chuck unless he bribes them, oddly enough, but you can also use the money in various vending machines for a quick pick-me-up or a weapon, in some cases. You can also head over to the pawn shops that pop up in different parts of the strip and purchase various tools of the trade, keys for locked vehicles that you can putter around in, and Zombrex, which is a vital item as the game progresses. Several missions and even a survivor need this in order to keep someone from turning into a zombie, most notably your own daughter, so you’ll need to keep some on hand at all times. Granted, there’s plenty of the stuff just lying around, but even so, it’s nice to have the option to acquire it if you’re desperate. In a first for the series, the game also allows for two player co-op in a way that’s surprisingly well implemented. You don’t need to set up any sort of multiplayer game, as players can simply jump in and out of your game as they wish, and while the player gets no credit for missions you complete, they can still earn PP, money and achievements as you play together, so there’s plenty of reasons to jump in and play with a friend. The game has also been tweaked a bit to make the experience a good bit more enjoyable all around. The game is a good bit less difficult, as psycho battles no longer feel like impossible battles that require that ONE weapon just to be manageable and survivors are a good bit better about keeping themselves alive. In fact, since survivors don’t experience weapon deterioration the way you do, and they don’t run out of ammunition for guns, it can be entirely practical to arm a bunch of survivors, then bring them along to fight a psycho, as I discovered when I armed a British rock band with assault rifles and camped them in a store while fighting Slappy, a psycho wearing a massive headed mascot costume. Fighting him on my own had proven to be a colossal pain, but having the Brits light him up with machine gun fire? Yeah, that made things a good bit more manageable. It also bears noting that, aside from the main online co-op play options, there’s also an online version of Terror Is Reality, which you can play with four players, which allows you to take on various mini-games revolving around killing zombies and pays out cash prizes. It’s not a particularly robust mode or anything, but it pays out fairly well and it’s fun enough to be worth spending some time with. The game can be completed in about six to eight hours, depending on what ending you go for, but there’s a lot of content to bring you back. Aside from the multiple endings to see, there are multiple files to fill in for your notebook, which tracks who you meet up with throughout the course of the game, meaning that you’ll have to meet every survivor and psychopath to fill it up, which can easily take more than one playthrough. There are also unlockable bonuses, such as Arthur’s armor from Ghouls and Ghosts and various other costumes, and you can spend plenty of time earning cash to unlock all of the various vehicles to drive around in. Jumping in and playing with a friend is also a good time, if only to see all of the absurd things that can happen, and I can attest to the fun that can be had running around doing stupid things with friends. Watching your friend run you over with a pink tricycle, stop, ring the bell and ride away is pretty hilarious, as is ripping apart bosses in the swimsuit from Borat, and why not share it with a friend, right? There are also a good amount of achievements to earn, between dressing up in every outfit, braining zombies with multiple types of weapons and other stuff, so those who enjoy wringing every last minute of enjoyment out of a game will have a lot to keep them interested in this game. 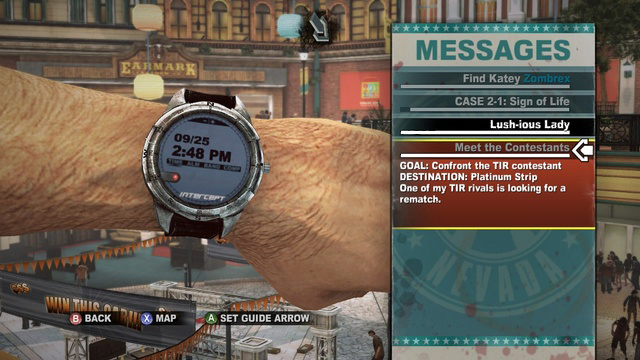 Which is not to say that Dead Rising 2 is not without its flaws. For one, the game has some odd pacing issues. Basically, there are things going on at various points throughout the game, which is fine and gives you all sorts of objectives to strive for, but the problem is that if you’re actively following the storyline, there are several points where you find that there is literally nothing going on for two or three in-game hours, which is, frankly, boring. If you’re trying to accomplish other tasks in addition to completing the story, saving survivors and wrecking psychos this might not be a big deal, but if you’re focusing on that, the lack of anything to do for multiple hours can be annoying and feels like a less than optimal use of your time. Further, the online co-op has technical issues that may or may not be related to the preorder DLC, and as a result, saving while playing co-op often kicks the other player out to the menu, which is annoying and a waste of time. Speaking of the online, while TIR is fine enough on its own, it really feels tacked on, and it took me forever to even get into a game in the first place just to test it out, so I’m confident in saying that it’s not going to be something anyone spends a lot of time with. Also, while it’s understood that you’re in Vegas, essentially, the gambling mini-games that pop up are annoying as hell, especially when you’re trying to save survivors. No, I don’t want to play poker, I want to save your lives, and you are morons because there are card tables IN THE SAFE HOUSE. Work with me here. The gameplay also does carry over the annoying problem the last game had, where in situations where multiple items were in range to be interacted with there was no easy way to choose the one you wanted, leading to annoying games of repositioning yourself or throwing items around to make something work, and this is no less unwelcome this time around. The save system of having to save in the toilet and losing lots of progress if you neglect to do so is still here in full force, and while the game makes it a bit easier on you by prompting you to save after various storyline points and offering multiple save slots, this is two thousand and ten, I have a hard drive, and there’s really no reason you can’t autosave or at least let me save whenever I want, especially when saving could take a fair amount of time depending on my proximity to a toilet. There are other odd little technical snafus (Arthur’s armor breaks the map, no, really) and annoyances (why can’t someone else give Katie her medicine I mean come on now) that pop up here and there as well, but these are fairly minor and for the most part not game changing. All told, Dead Rising 2 is both a worthwhile sequel and a good game in its own right, as it retains the elements that made the first game fun and adds in plenty of new ones while fixing some other issues. The story, while no less corny, is presented in a better manner that makes it more enjoyable overall, the visuals are more impressive and interesting than those of its predecessor, and the audio is as solid as ever. 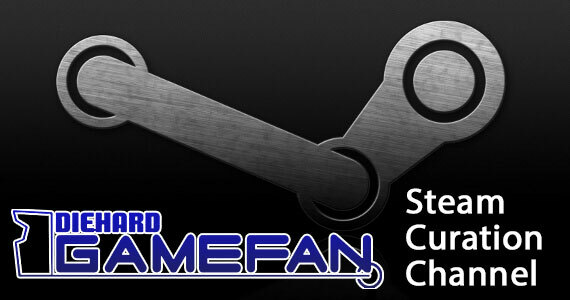 The game is easy to play and the mechanics take little time to learn, and newbies and fans should be able to get into the game in minutes without a problem. All of the great elements of the first game were fully retained, and new mechanics like weapon combination, earning and using cash, and more were added into the experience. Further, the AI of the survivors has been greatly improved, the difficulty has been balanced out a bit more, and online co-op play has been added, making the game all around a better product than its predecessor. The game showcases some odd pacing issues at times, unfortunately, along with some odd technical and mechanical issues here and there. Further, there are at times some annoying aspects to the game that make it frustrating at times, and the TIR online mode seems like an afterthought more than anything. These issues don’t take enough away from the game to make it hard to recommend, however, as Dead Rising 2 is one of the better games to come out this year, and if I didn’t have this review to write, I’d probably be playing it right now, so there you go. 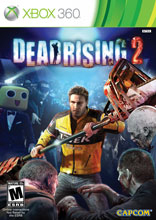 Dead Rising 2 is a well improved sequel that retains all of the great elements of the original game while adding in plenty of new features and options, and fans of the first game will enjoy it as easily as newcomers, making it one of the better games to come out this year. The story is enjoyable, if corny, and the game is both visually and aurally well designed all around. 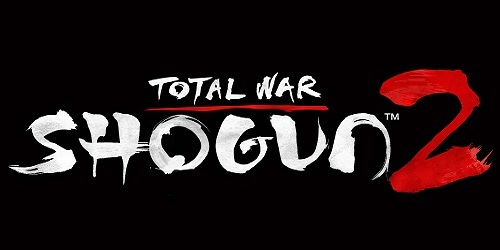 The gameplay is easy to get into and understand for both fans and newbies, and the numerous additions, like combination weapons, improved ally AI and online multiplayer, on top of the massive amount of content in the game makes for an experience that will keep you coming back for a long time. 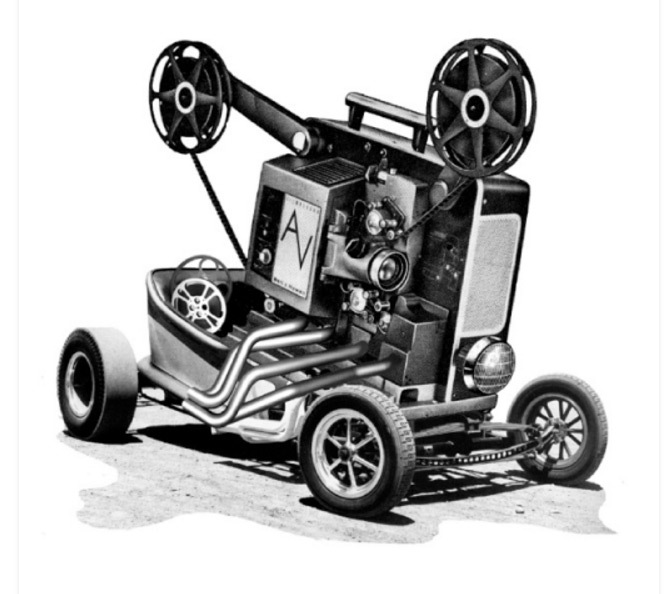 There are some odd pacing, technical and mechanical problems here and there that make the experience frustrate a bit more than it should, along with some minor annoyances in design that can cause a headache. The TIR online mode also doesn’t really add anything to the experience and isn’t likely to inspire your interest after a time or two at it. Even with these flaws, however, Dead Rising 2 is superior in about every way to its predecessor and is one of the better games to come along this year, and anyone who loved the first game, or games with zombies in general, will have a pretty good amount of fun with it all in all.